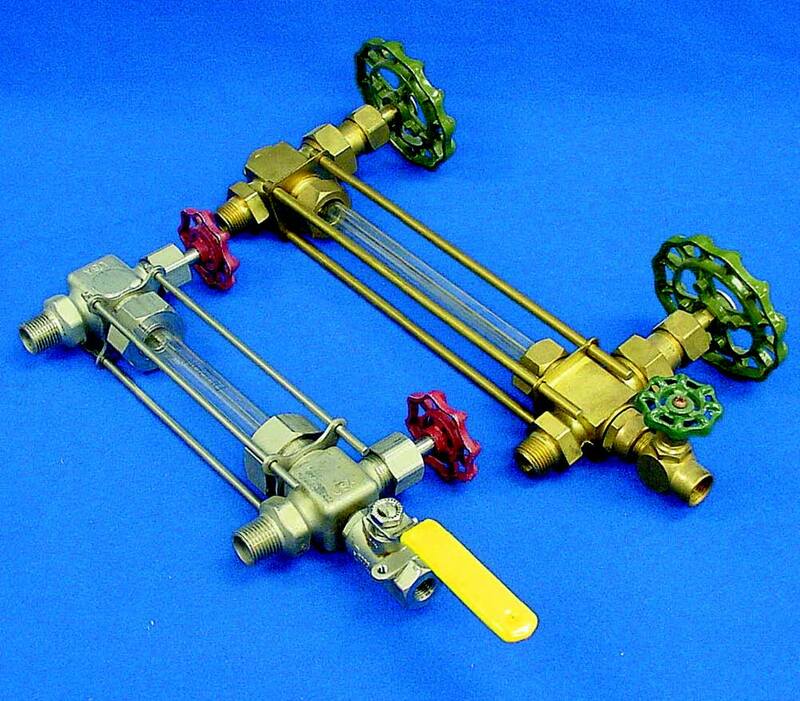 Valves are used in both domestic and industrial situations to control the flow of liquids, solids and gases. 3. To isolate systems and protect products. Gate Valve: Used for shut off - ON/OFF function. 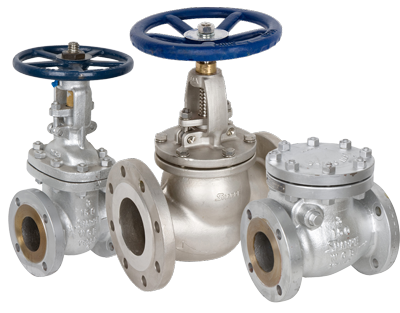 Globe Valves: Used for control of flow and shut off. Butterfly Valves: Used for control of flow and shut off. Relief Valves: Spring loaded to open at a given pressure, and used to protect systems from over-pressure. Check Valves: To allow flow in one direction only. Fusible Link Valves/Piston Operated Valves: Quick acting and used for emergency shut off. Twin Sea valves: Used when tight shut off required. Semi-Needle Valves: Used in conjunction instruments to bleed off part of the flow. Ball Check Valves: Used with gauge glasses as safety precaution. There are other less commonly used types of valves. The actual construction/design of gate valves, for example, may vary widely depending on its application,the materials used, or the manufacturer’s own special features. The basic principle, however, will be the same. Valves can be specially made to work at high or low temperatures (cryogenic), or to very high standards for use in explosive atmospheres, or when no leakage is permissible. 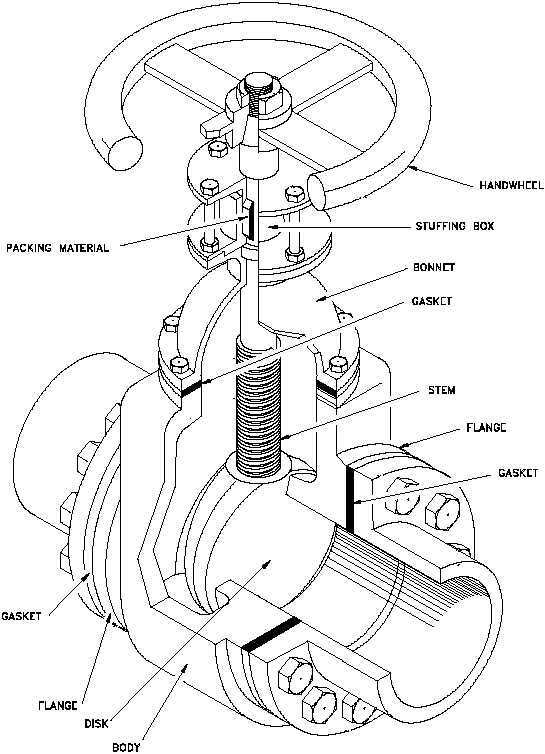 All valves are prone to leakage as it is difficult to obtain a perfect seal, although the use of special seal materials and designs can have very good result If high security is required, use can be made of two valves in series, one to act as the main valve and the second as a back-up should the first fail. A wide range of materials is used in valve manufacture, the particular material depending largely on the fluids to be handled. Iron and steel are mainly used for oil/petroleum applications with most valves being made of mild or alloy steel. Brass valves are used for water (as well as cast iron, steel and other alloys). Stainless steel is used for acids and other corrosive liquids. Bronze is also a commonly used material which can cope with most liquids. As well as the main seal between valve and disc, wedge, etc. there are other seals required to prevent external leaks. Gaskets or ‘0’ rings are used between surfaces such as flanges, where no relative movement takes place. The main problems occur around the valve stem, which both rotates and, in some cases, moves vertically as well. Special glands or packings are used which can be compressed by gland nuts to increase sealing. Special materials have to be used in corrosive applications, but an asbestos based fibre is a commonly used packing material with PTFE/Teflon being increasingly common. ‘O’ rings can also be used as shaft seals and are generally made of rubber. Many smaller valves are hand operated if they are accessible. Larger valves require power actuators and inaccessible valves of all types require some form of mechanical or electrical actuator. Pneumatic (compressed air) and hydraulic cylinders and mechanisms are widely used in larger applications. Smaller valves can be operated with solenoids, but larger valves require more complex motors and mechanisms for electrical power operation. Care must be taken that valves, flanges, etc. and other equipment are compatible, or leakage may occur. API flanges and other equipment are commonly used in the oil industry. The standards lay down performance requirements as well as dimensions and material. Valves are rated according to the maximum pressure and temperature at which they can safely be used. Quick closing valves can be installed in pipelines and systems to isolate sections in case of fire, leakage or other emergencies. If the valve can be installed so that the line pressure will help to close it, this will increase the sealing capability. 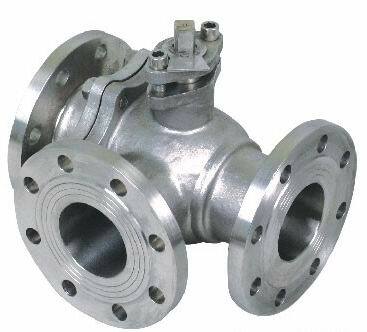 Swinging check valves are often used as the basis of a quick closing valve, although ball valves, plug valves and butterfly valves are also suitable. Purpose: gate valves are used when a tight shut-off is required. They must not be used for throttling (i.e. must be fully off or fully on) as a restricted flow through a gate valve will erode the seat of the wedge disc. The wedge-shaped disc is moved up to open the valve by turning the wheel anti-clockwise. To shut off the flow, the wheel is turned fully clockwise until the disc is properly seated and covers the opening. One common type is the rising stem type. In other designs, the wheel is fixed to the stem and rises with it. The position of the stem/stem and hand wheel indicates whether the valve is open or shut. If the stem is raised, the valve is open. Purpose: Ball and plug valves are used to provide a quick, simple shut-off. They are operated by turning the ball or plug through 90º. Ball and plug valves should not be used for throttling, as a restriction in the flow will lead to erosion of the valve. The ball or plug has an opening through the centre. When this opening is in line with the inlet and outlet ports, flow will be allowed. When the ball or plug is turned through 90; no flow can take place. Good sealing can be obtained, particularly when special sealing rings made of PTFE/Teflon are used. Some ball and plug valves are lubricated to provide a seal and prevent wear, and should be regularly lubricated with the proper lubricant. When the hand wheel is turned clockwise, the disc is against a seat, stopping the flow. Turning the hand wheel anti-clockwise lifts the disc from its seat and allows flow to continue. The high pressure is usually on the bottom of the plug, so that the stem, seal, etc. are not under continuous pressure. Applications are widespread, including domestic water taps. Purpose: Butterfly valves are used for controlling flow and can act as a shutuoff ~va1ve, if the sealing arrangement is designed accordingly. The disc or wafer rotates about a vertical axis and can be turned through 90º. The disc seals against the opening to cut off flow and can be positioned at a point between fully closed and fully open as required. Some butterfly valves have a direct acting lever, others are operated through gearboxes when finer control is required. In most cases, a clockwise movement will close the valve. Purpose: Relief valves are used to protect systems from over-pressure or to control processes by allowing flow to commence when a certain pressure has been reached. pressure. The spring force will then release the valve. Relief valves operate automatically and are usually pre-set to a specified relief setting by the manufacturers or adjusted when in use, if required. Re-calibration is then required. Purpose: Check valves allow flow in one direction only. One common application is in the discharge line of a centrifugal pump to prevent reverse suction. The two designs operate on the same principle: flow through the valve holds the plug or disc in an open position. If flow ceases or falls to below the backpressure ahead of the valve, then gravity or the back pressure will tend to return the plug to its seat. Check valves are automatic in action. Purpose: Twin-seal valves may be used when an extra tight shut-off is required. They are basically plug valves, but have an additional action which forces sealing segments against the inlet and outlet ports providing a positive seal. 1. Unsealing the sealing segments. Purpose: Semi-needle valves are used to control instruments and can stand high pressures of up to 2,000 psi. rate of flow can be adjusted as required by raising the needle. Purpose: These valves are used to prevent loss of liquid and consequent damage or injury, in case of breakage of gauge glasses. 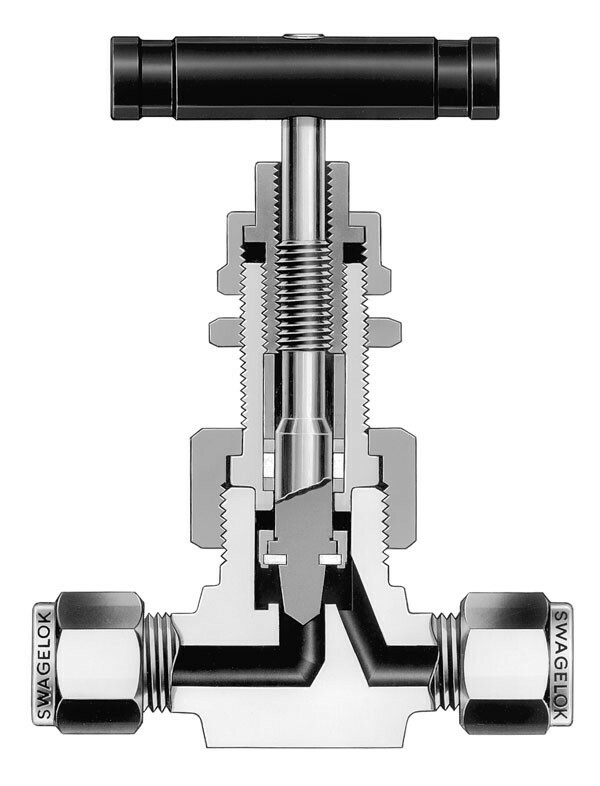 When a reading is required, both valves should be opened slowly 1 to 1 1/2 turns to allow the fluid to find its level. The tip of the valve stem prevents the ball from seating at this point As soon as flow stops and the level stabilises, the valves must be opened fully so that the ball can be pushed into the outer seat by the escaping fluid if the glass should break. To close or reset the valve, the handle should be turned clockwise until the valve top is firmly against the inner seat, and then re-opened slowly after the gauge glass has been replaced, if necessary. 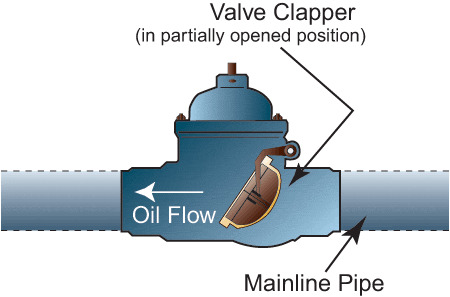 Direction of Flow: Direction of flow is usually marked with an arrow in the case of check valves and globe valves. Direction of Opening/Closing: Hand wheels and levers - clockwise to close, anti-clockwise to open. Levers - usually lever in line with pipe - open, lever at 90º to pipe - closed. Open and close valves slowly. Valves should always be opened and closed slowly, except in emergencies. Too rapid closing can cause pressure waves to build up and travel back through the system, possibly causing severe damage, burst or injuries. This phenomenon is known as “water hammer” in domestic water systems and a loud knocking noise can be heard in the pipe. Gate and Ball/Plug Valves: Gate and ball valves must only be used in the fully open or closed positions. Intermediate setting can cause turbulence, which can wear away the valve very quickly and cause internal leakage. Gauge Glass Valves: Gauge or sight glass valves must be fully opened as soon as the fluid has reached its level or there will be no protection if the glass breaks. Interlock/Keys: Some valves are not fitted with hand wheels or levers and can only be operated by special keys or spanners. This is because the setting of the valve is critical and must not be altered except by an authorised person. Similarly, some valves are sealed with wire; locks or other means and must not be tampered with or altered as serious damage could result. Do not Open/Close too far or use unnecessary force. If gate and globe valves are jammed too far open, they may seize or be damaged. This is called “backseating” and puts unnecessary strain on the disc, which may break off. It is best to re-close gate and globe valves by 1/2 to 1 full turn after they are fully opened. Similarly, over-tightening the valve when closing it may damage the disc and seat leading to seizure or leakage. If valves prove stubborn to open, mechanical assistance such as a valve wrench or spanner can be used. The minimum amount of force should be used and before applying the “persuader”, check that the valve is not already open. Do not use persuaders on twin seal valves or on very small valves, which may break off. 1. "ON/OFF": Stopping or starting flow. 3. "Checking": Permitting flow in one direction. 4. "Switching": Switching flow along different routes. 5. "Discharging": Discharging fluid from a system. Thanks a lot for your comment Abdel Halim. It would be a better guide if you added legends for each vavle, like ▷●◁ for a ball valve perhaps. 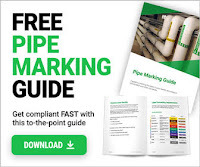 Dear Brass, you can check for those symbols at http://www.pipingguide.net/2008/12/piping-instrumentation-diagram.html Thanks for the nice advice b/w. Is there an ability to get your review for transformer oil regeneration equipment GlobeCore?